A French court convicted American billionaire investor George Soros of insider trading and fined him $2.2 million Friday. The fine by the court was in line with the request by prosecutors — the same amount the Hungarian-born magnate and philanthropist was accused of having made from buying stocks at French bank Societe Generale with insider knowledge 14 years ago. Soros lawyer Bernard du Granrut said the court "did not acknowledge the essential elements of the arguments we presented," and said he would consult with Soros about an appeal. Soros, 72, the president of Soros Fund Management, denies having privileged information. He was not in court Friday. In court testimony in November, Soros said: "I have been in business all my life, and I think I know what is insider trading and what isn't." Societe Generale was privatized in 1987. A year later, its stock price went up during an unsuccessful takeover bid. 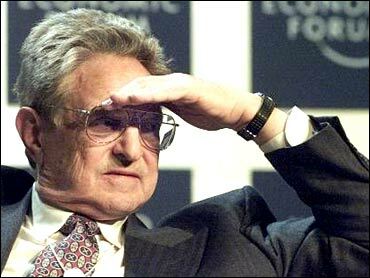 Soros was accused of having obtained insider information before the abortive corporate raid pushed up the stock price. Soros went on trial with two other men, Jean-Charles Naouri, former top aide to France's then-Finance Minister Pierre Beregovoy, and Lebanese businessman Samir Traboulsi. The court cleared Naouri and Traboulsi of any wrongdoing. Prosecutors had sought fines of $290,000 for Naouri and $1.98 million for Traboulsi. Soros has said he was interested in Societe Generale based on information he claims was widely known: France's leftist government of the time favored takeovers to change the leadership at recently privatized companies. Soros said he was buying stock in many companies and had no reason not to include Societe Generale. Afterward, he sold the stock, saying he felt the takeover attempt was politically motivated and was not going to benefit the company. Soros was reportedly the first American to earn $1 billion in a single year. Born in Budapest in 1930, he emigrated to the United States in 1956 and became a citizen five years later. He made his fortune managing investment funds. Forbes magazine ranked him this year as the 37th richest person in the world, with an estimated $6.9 billion fortune. That means that the fine, if Soros were eventually forced to pay it, would represent roughly three-tenths of one-percent of his net worth. For the median American household — with a 1998 net worth of $71,600 — the equivalent fine would be $22.83. Prosecutors said the case dragged on because Swiss authorities took years to respond to requests for information. Defense lawyers argued unsuccessfully that the case should be thrown out because it took so long to bring to court. Soros is an extremely generous philanthropist but also is regarded by some as a bully financier. He is almost single-handedly credited with driving the United Kingdom from the European Rate Mechanism, the precursor to the Euro, in 1992. During the Asian financial crisis in 1997-98, Malaysia's president blamed him and other speculators for creating a confidence crisis in their currencies.